The graphic below displays demographic data about Forsyth County’s aging population. The total population of Forsyth County is 368,745 people. About 20% (72,800) of the people in Forsyth County are 60 years and older. When looking specifically at the target population of adults aged 60+, 25% (18,500) are 60-64, 44% (32,000) are 65-74, and 31% (22,300) are 75+. 21% (15,200) of people aged 60+ are African American, 77% (56,300) are White, and 2% (1,500) are another race other than African American or White. 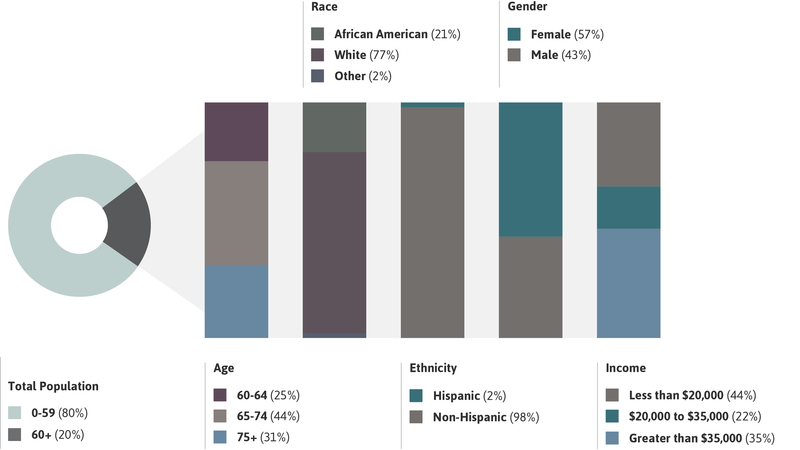 2% (1,500) of people aged 60+ are of Hispanic or Latino origin. 57% (41,600) of people aged 60+ are female. 43% (31,200) are male. 44% (31,700) of people aged 60+ make less than $20,000 per year, 22% (15,700) make more than $20,000 but less than $35,000 per year, and 35% (25,400) make more than $35,000 per year.